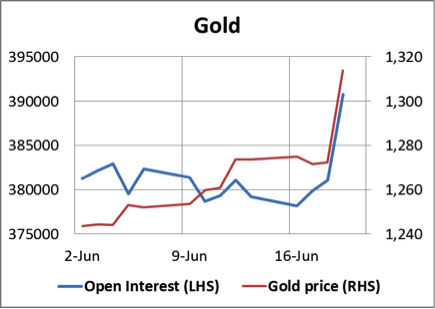 Following on from last week when Iraq hit the headlines and the price of oil firmed up, gold was steady for the first three trading days. It seemed the shorts just held their breath and hoped Iraq would go away. But with oil prices up yet again Thursday a vicious bear squeeze followed after someone bought over 3,500 gold contracts, driving the price up to just under $1300. Once this level broke at 13.40 New York time, gold jumped a further $15 as stops were triggered. Silver also responded dramatically, rising through the $20 level to $20.90 for a gain Thursday of 5%. The price action and open interest this so far month is shown in the following charts and illustrates how record bear positions are being squeezed in both metals. 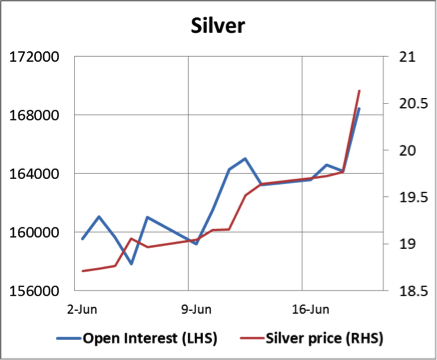 Note also that yesterday’s action involved many new players, evidenced by the sharp jump in open interest, in silver’s case to a new 18-month record. The news hanging over the market was the release of the Fed’s FOMC minutes on Wednesday, but they contained few surprises. Another $10bn of tapering is to be lopped off QE3 as expected, and there was some jawboning about economic recovery, which has been revised down slightly. The reality is the Fed’s monetary policy has failed to stimulate the economy and the inflationary consequences the principal result. Food prices are rising, not helped by the Californian drought, and now energy prices are trying to discount deteriorating prospects for the Middle East’s supply. It is traditional to blame special factors, but the fact is the money has been created to support higher prices. In the UK the Bank of England is fretting over asset inflation in the housing market and knows it will have to normalise interest rates sooner rather than later. Japan is printing yen to pay the government’s bills, and both the IMF and the ECB are terrified the Eurozone is slipping into deflation. With monetary policy failing in all the advanced economies and western markets badly short of precious metals, it is hardly surprising gold and silver prices are now rising. Look at it from the bears’ point of view. Not so long ago they were encouraged to think the third assault on gold’s $1200 support level would drive the price down to $1050. Instead it failed to go below $1240. Suddenly it looks like there is underlying strength and the primary trend is up. The Bank of England released its Annual Report on Monday, reporting that gold in their custody fell for the first time since 2006 by 755.45 tonnes. Last year I broke the story that on the Bank’s own information between 28th February 2013 and the following June the Bank had transferred up to 1,300 tonnes of gold from its vaults. The new year-end figure is in line with with this reduction, bearing in mind there are transfers both in and out of the Bank’s vaults every week, many of which are not the result of market transactions. US: Flash Manufacturing PMI, Existing Home Sales. US: Core PCE Price index, Initial Claims, Personal Income, Personal Spending. UK: Current Account, GDP (3rd est. ), Index of Services. Eurozone: Business Climate Index, Consumer Sentiment, Economic Sentiment, Industrial Sentiment. Snap Yours Up Now at SDBullion!